I've been thinking of this one for a long time, the original idea came from and antique pocket knife I saw a photo of. 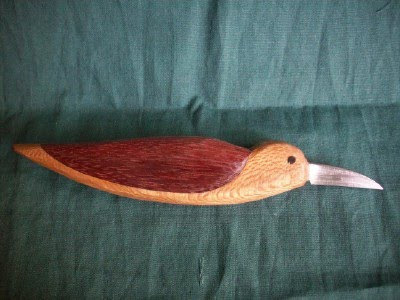 The body is Lacewood (smells like poo when you cut it) and the wings are Purpleheart (hard like rock), the eye is Ebony. Picture was taken a day or maybe two after carving, the purple heart gained color as time went by- brown when you cut it, purple increases as it oxidizes. It's a simple carving, basically shaped like a million other wooden handled knives, the joinery of the pieces (Intarsia really) was the more important aspect of the handle. Actually the concept was the most important aspect, followed by the joinery, then the carving. I wanted the blade to be a part of the sculpture, as opposed to stuck in the end of a carving. Make no mistake- I've seen some excellent carved knife handles whose blade was not part of the figure, there are probably some in my future too.